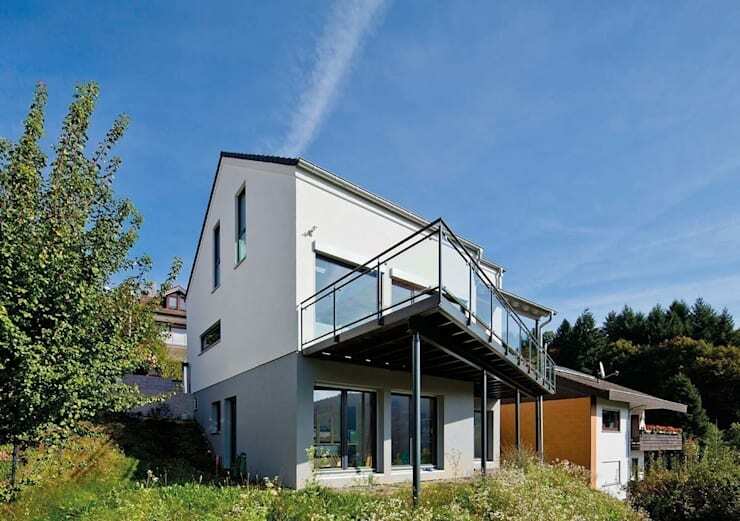 Home building professionals, Fingerhaus GMBH, are experts when it comes to designing homes that take on different shapes and volumes, playing with different spatial planes. In this gorgeous home that we explore today, we will see how they've created a seemingly very simple and small family home—but not everything is what meets the eye! As we explore this home from the outside in, we will see how it takes on different forms and dimensions, resulting in a very stylish and sophisticated piece of architecture and design. 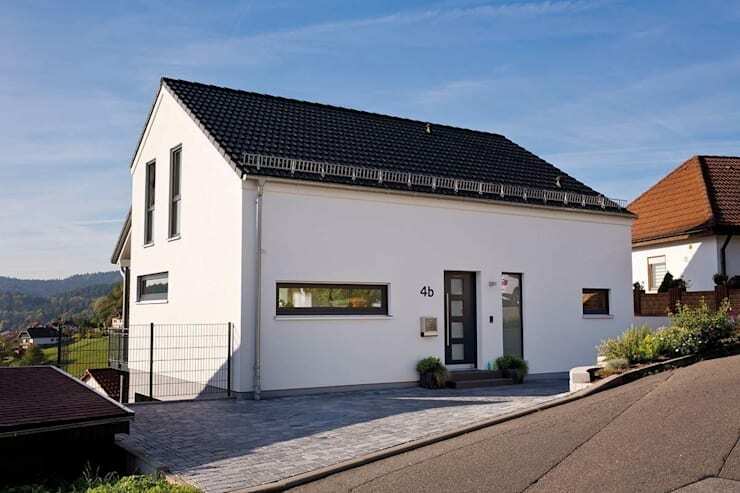 From the front, this home looks like a simple family home made up of one storey. It is modern and sleek with clean lines and neutral tones, but it looks very understated. The different shaped windows interspersed throughout the facade create a very unique look and feel. The front door even features windows throughout it, giving visitors and guests a little glimpse into the interior of the home. 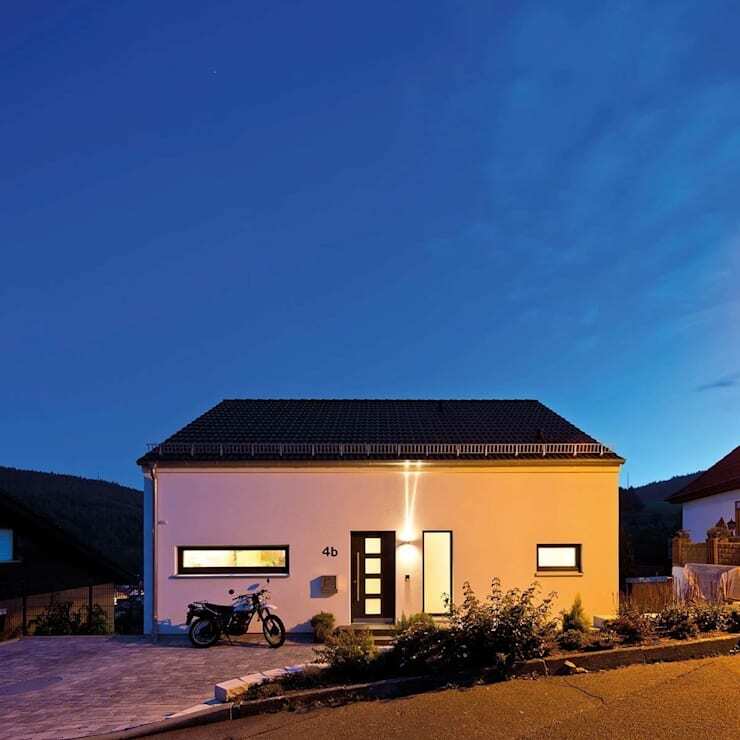 It's always worth taking a look at how a home looks a night, and we think this little house looks fantastic. What's striking in this image is how the lighting installed throughout the facade illuminates the details and design. It also creates a beautiful soft glow, making this home even more welcoming and warm. This is a great design tip! Have a look at these: Outdoor lighting ideas for modern houses. If we go around to the back of the house, we come across a whole new perception of the home. It's difficult to believe that this is the same house that we saw at the front! By playing with the landscape, the designers have moulded a two-storey building into the incline of the slope. The result is a very striking design that packs quite a punch! On each floor, large glass windows and doors open the home up onto the back garden, creating a beautiful interaction between the interior and exterior spaces. They also ensure that the family home is packed with natural light. On the upper floor, the architects have built a large balcony/terrace area. This visually and physically expands the living space, creating a whole new living area. If we go into this home, we really get a sense of how breathtaking the design is and how strategic the architects have been in working with the gorgeous landscape. The dining room features warm wooden floors, which match the warm wooden furniture. 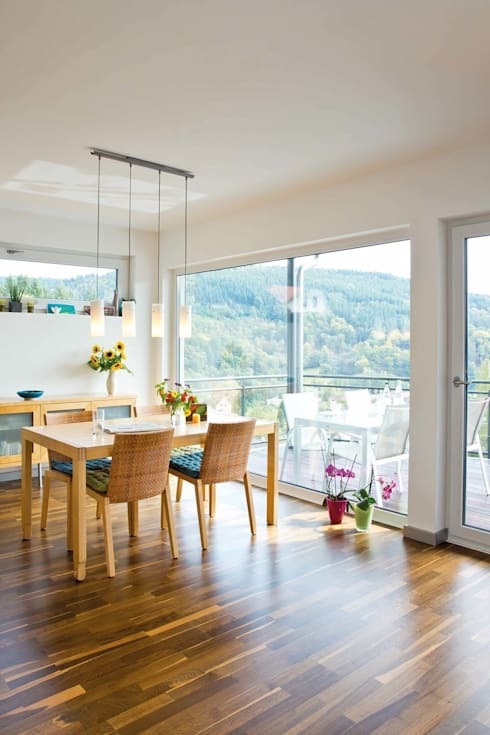 The wood illuminates the natural light that flows through the large glass windows and doors. We can see that there is also an outdoor dining area on the terrace, where meals can be enjoyed in the sunshine. Don't you love how the designers have used vases of flowers and pot plants to decorate the interiors subtly—a great design tip for any room in the house! Natural light plays a role throughout this home, opening up the interior spaces. They've achieved this by utilising large glass windows and doors as we've seen in the other images. 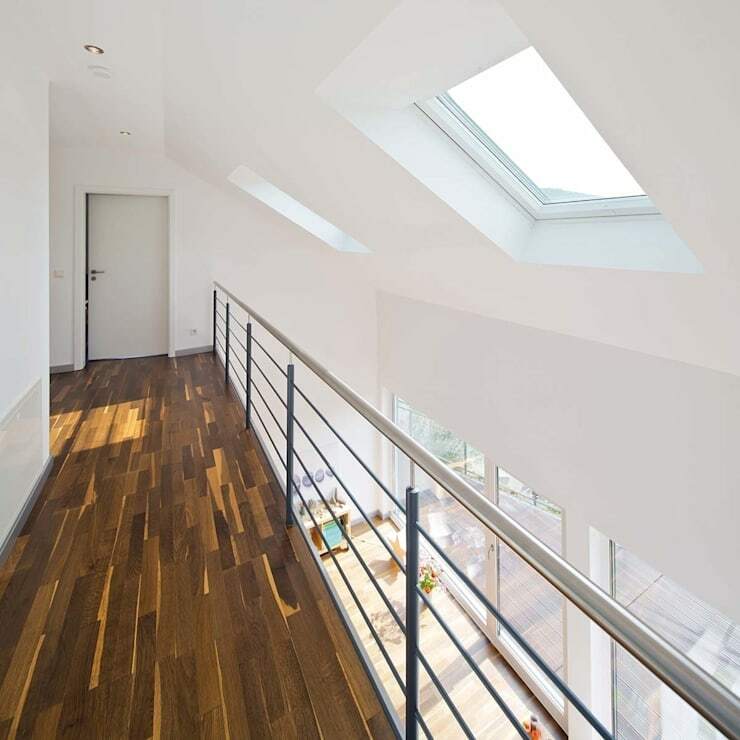 Another design trick to achieve a stylish, light and bright interior design is to install skylights throughout the roof. Can you see how it makes a huge impact to the second floor? As we explore the rest of the family home, we can see how colour is introduced to create a charming and inviting interior design. In this bedroom, the designers have used a neutral colour palette for floors and walls, but have introduced colour in the form of cushions, linen and a desk chair. This is a very effective design trick! In this bedroom, we can see how the designers have once again added colour in the form of linen but they have also added artwork to the space for charm and personality. Artwork is a wonderful expression of personal taste, which is why it is always a great addition to a family home. You can also go for family photographs or decor pieces that speak to who you are. By placing these strategically around your home, you can end up with a unique design that is incredibly effective! If we head into the kid's bedroom, we can see how the designers have gone for very trendy, stylish and retro furniture pieces. The furniture used throughout this space is lightweight and introduces different colourful tones, which makes for a very effective look and feel. Remember that with a kid's bedroom, you can afford to have a little bit of fun and be a little bit creative. Don't be afraid to bring in some bold shapes, colours, patterns or even themes. Have a look at these: Awesome bedroom ideas for the kids. The bathroom in this family home is very slick and stylish, becoming a little haven where family members can relax and regroup after a long day. You'll notice that there is plenty storage space in this room, including cabinets and shelves. This keeps all personal products neatly stored away. You want your bathroom to feel clean, neat and organised at all times so this is a must. 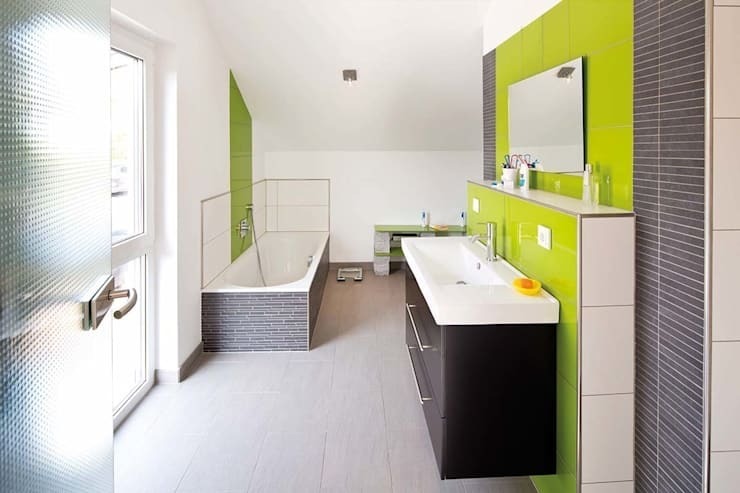 The splashes of lime green utilised in the bathroom contrast beautifully with the chic white bathtub and basin as well as the black finishes. This is a bathroom packed with charm and style. We end off our tour in the kitchen—the heart and soul of the home. Here we can see how the designers have gone for a minimalist look and feel. 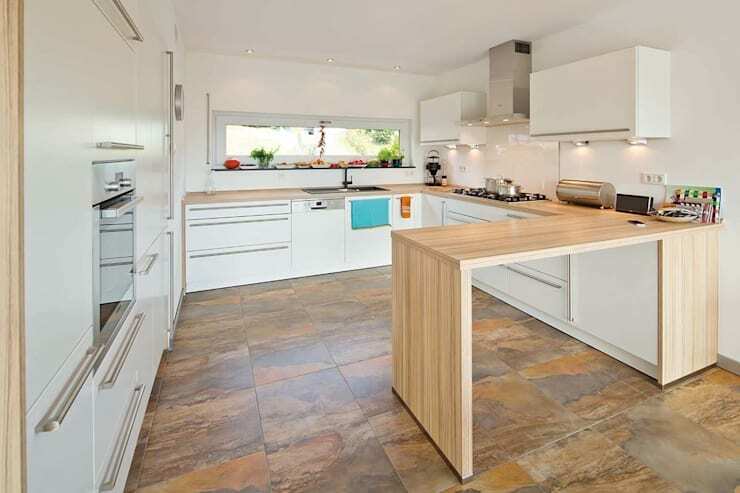 They've utilised neutral tones in this space including white cabinets and drawers as well as light wooden finishes. This works in harmony with the earthy stoned tiled flooring. The storage space throughout the kitchen has been used for all crockery, cutlery and glassware so that the counters are bare except for the most functional—a great tip! Don't you love the little breakfast bar that extends out from the counter tops? This is the perfect spot for the family to come together over breakfast cereal or cups of coffee.